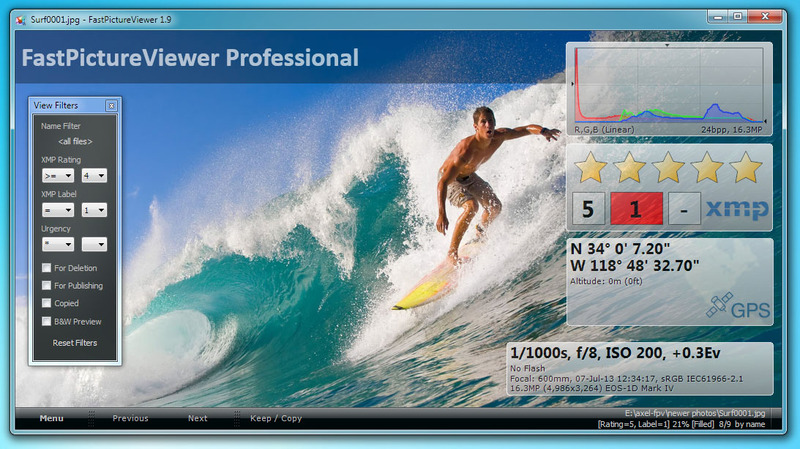 FastPictureViewer Pro is the best companion to Adobe Lightroom and other digital asset management systems: use it to weed-out your pictures before importing them for development and editing. FPV Pro has all the tools you need to quickly decide if you want to keep an image or not: full color management for faithful color rendition, instant zooming to 100% and back, to check for sharpness, instant RGB histogram to evaluate the exposure, instant lost shadows / highlights view to see where the blocked-up shadows and burned-out highlights zones are located and their extent, and instant EXIF shooting data at a glance. - Maintenance release with small performance improvements.